In 2014, the heart-breaking epidemic of young people leaving the church reached a climactic point in my ministry. I had watched false teaching and pursuits of humanistic selfishness claim the spiritual loyalty of so many and I just wanted to do something - anything! That is when the idea for the "Keep the Faith!" Project took shape. In the fall of that year, my son, Gabriel, and I began interacting with young people with the specific intent to encourage loyalty to the church and doctrinal soundness. A year and three months later we are blessed to report that over 50 names have been added to our contact list. Each participant receives at least 2 communications from us each month and their responses are very encouraging. 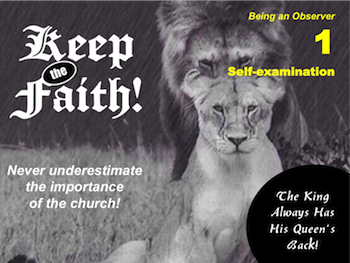 As the New Year begins, we are adding a Bible study guide and personal assessment survey to the "Keep the Faith!" mailings. We believe this material will help young people make positive steps toward preserving their faith and understanding their essential place within the body of Christ. I will be using several of these study guides in my weekly blogs so that you can see the type of material we are presenting. It is my prayer that you will also apply the assessment to your own spiritual growth and share this material with your friends. Young people are not the only ones deserting the church. As the ominous indicators of approaching persecution multiply, nothing is more important than spiritual preparedness. Let's start this New Year with a deeper resolve to treasure the church and keep the faith! Every Christian should go through at least three stages of spiritual growth. First, like a newborn baby thrust into a strange, unfamiliar world, a new child of God is an observer. With wide eyes, they examine their fresh surroundings and wonder where they might fit into this new world. Secondly, after growing comfortable with their surroundings, new Christians launch out and become followers of those they respect. They mimic the behavior of others and follow by example. Thirdly, a few brave souls expect more from themselves than just observation and following others. They invest in the future and become leaders. A favorite children's song includes the words, "I'm in right, out right, up right, down right, happy all the time...." As they sing, they point in the direction that the words indicate. Within each of the development stages mentioned above (observe, follow, lead), there are four directions in which a Christian must grow. They grow by reaching in to themselves, out to their church family, up to their Creator and down to those who might be following them. These will serve as our guide for this important study. Exhausted, the man threw himself on the couch and said, "Honey, it was a terrible day at work! All the computers were down and we had to think for ourselves." Too often, like the man in the story above, we also spend little time thinking for ourselves. In this section, you will be asked to reboot the marvelous computer God has placed at the top of your shoulders. Take time to ask questions and enter data about the world around you. As you get started, you must first learn to reach in. Look within yourself. What do you have to offer the body of Christ? Whether you recognized it or not, God has been shaping you from the very beginning. He has given you experiences, skills, and personality traits that are greatly needed on His team. Will you let Him use them? Select the personality trait that best describes you and then write an advantage and a possible disadvantage to having that trait. Are you more easily excited or passive? Back to Top of "Keep the Faith! Being an Observer 1"